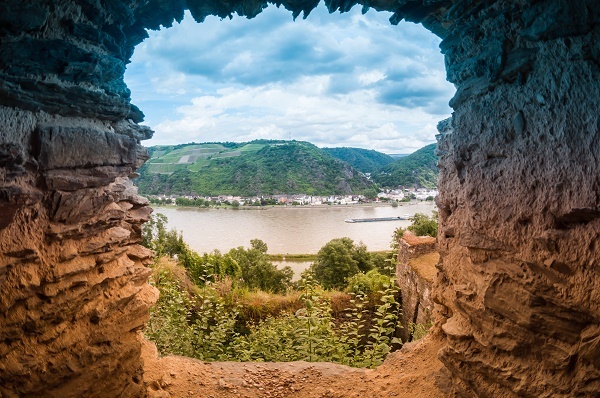 The castle ruins of Rheinfels sits looking out on the enchanting Rhein River. 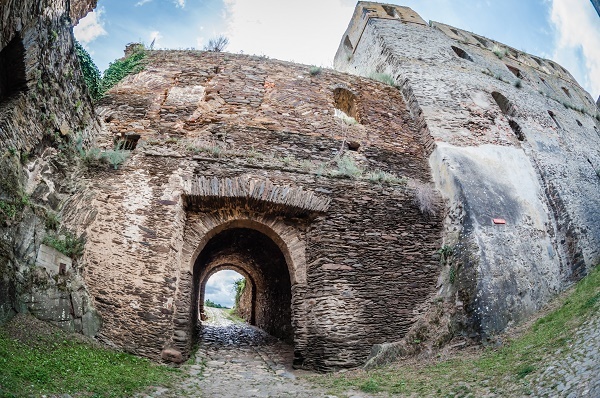 Soaked in history, this mighty fortress was built in 1245 and stood strong in sieges from attacking armies. 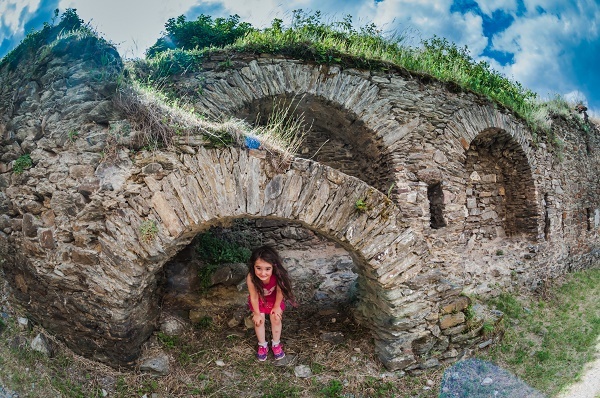 Today it awaits you to explore deep into its ruins. Only thing you need to bring is your imaginations of dragons, thrones, kings and knights! 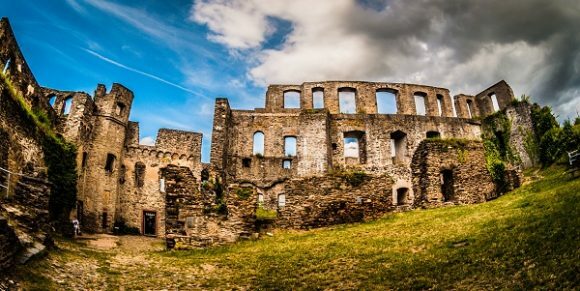 The Rheinfels Castle was built by Count Diether V von Katzenelnbogen originally to protect the tax collectors from the town below, St Goar. 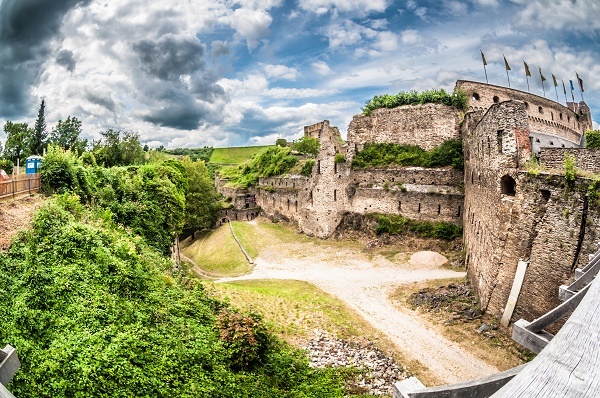 It then developed to be the one of the most massive fortresses in the Middle Rhine region. 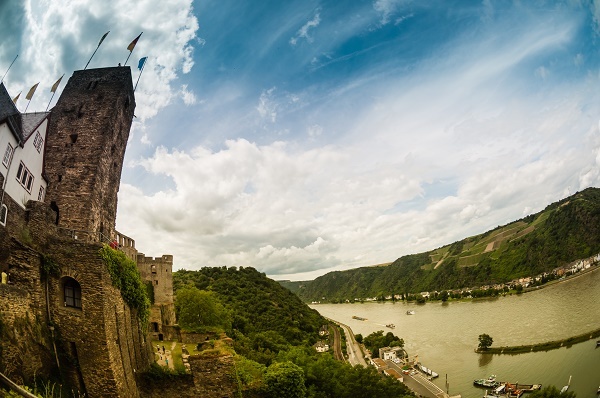 In 1692 the castle was the only fortress left on the Rhine that could defend itself against the French attacks that were led by Louis XIV. The castle could not defend itself anymore and it was handed over without a struggle to the French Revolutionary army in 1796. Sadly, that is when the castle and the exterior walls were blown up. 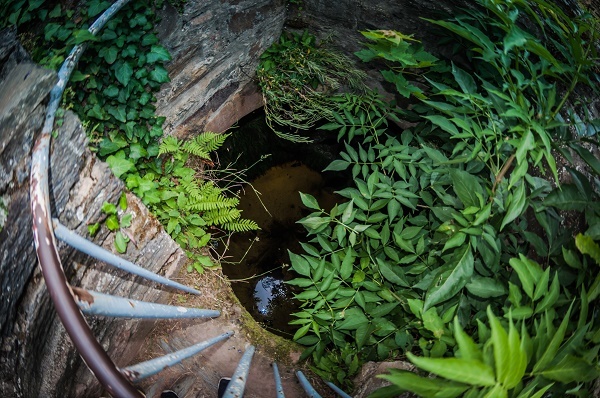 Because of its tumultuous history, now visitors can explore the castles labyrinth of trenches, tunnels and towers. 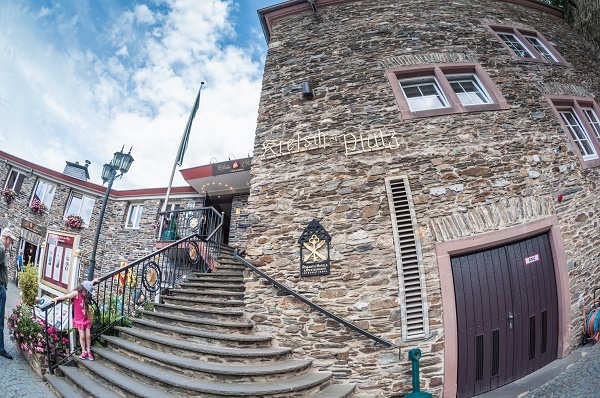 When entering the castle, you first walk into the lively castle courtyard bakery where a maiden would buy her bread and a luxury hotel where a noble knight would spend a night. 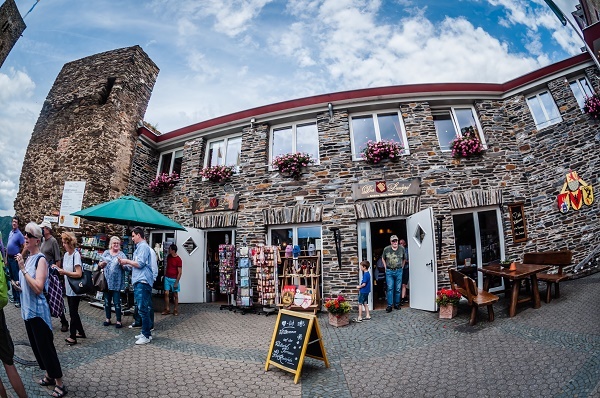 Present day the courtyard has a very popular gift shop. 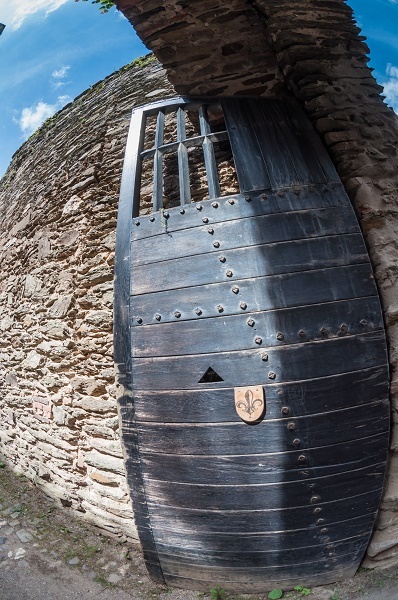 Here kids can can suit up and buy a wooden shield and sword for the dragons that they might face once crossing into the castle walls. Okay, adults can wear the armor as well if they wish! 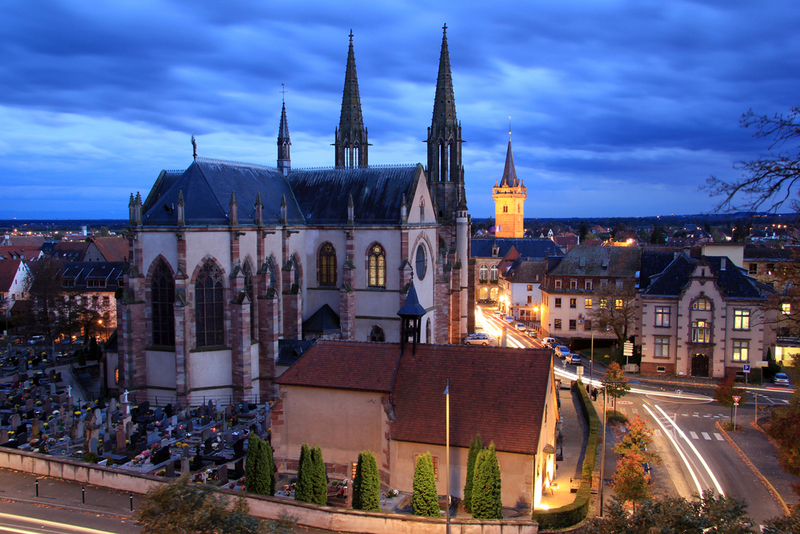 The first view you come to before the actual admissions window is a breathtaking sight! 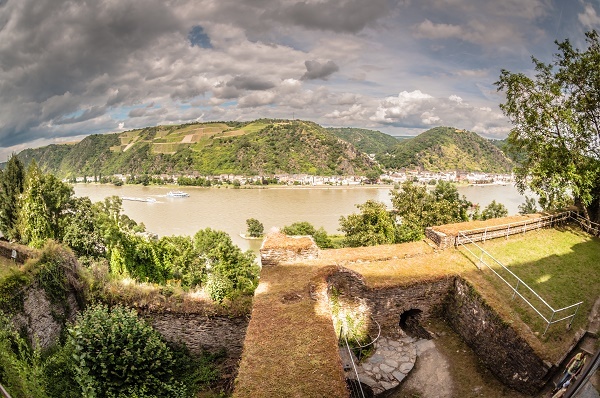 Right away you can understand why the Count chose this powerful spot on the Rhein and why others would want to have it! I could stay there all day and watch the boats go up and down the river, but I had castle ruins to explore! 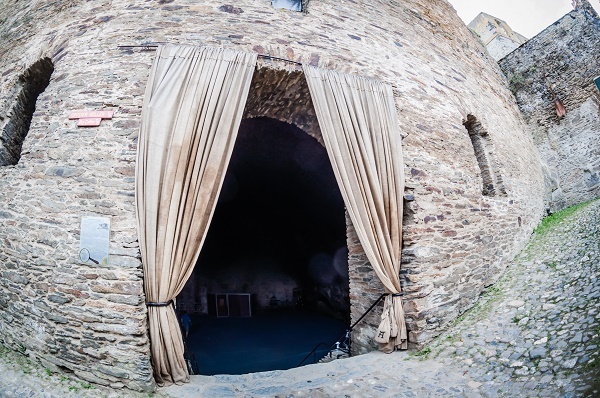 Entering the archway transports you to another time, a time where there were wars for thrones and power. This was a time when they had to give everything they had in order to defend themselves. These ruins still are strong and powerful. 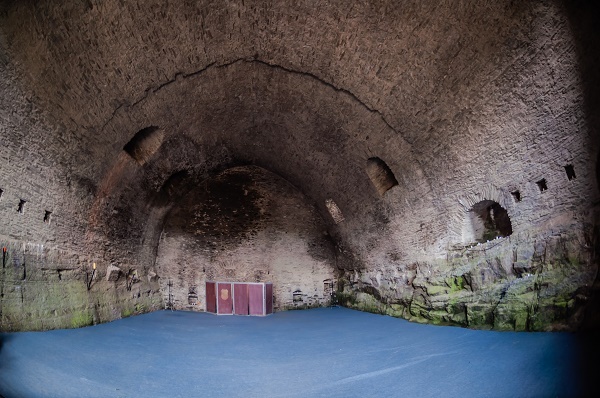 We walked into the castle’s cellar, which use to store food and wine since it stays so cool. Today it is used for torch lit weddings and events! Next we went into the mines! 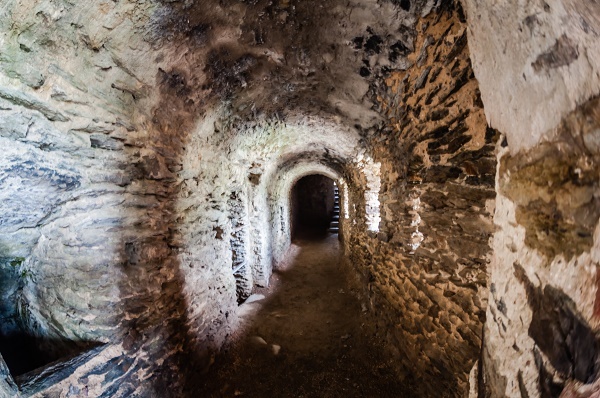 It is advised to bring sturdy walking shoes and flashlights for the dark parts of mines and tunnels. The mines were fascinating and seemed endless! At times they are very dark and were a tight fit. I try to imagine what it was like for a guard on night watch roaming in the silenced dark mines. 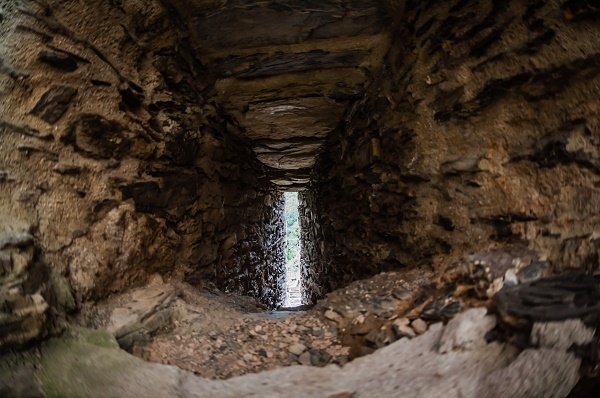 You can look through one of the slits and see how hard it would have been to shoot an arrow through the crack to hit your enemy. Then from the mines you can climb high up on a platform or a tower and soak in the beautiful view again. There are many courtyards to be discovered while following the provided map. 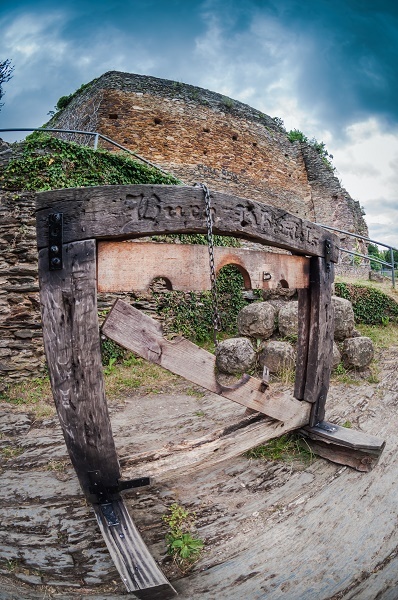 You will even come across a guillotine and an original castle well. Thanks to all of the horror movies I have seen, I couldn’t decide on which was creepier. 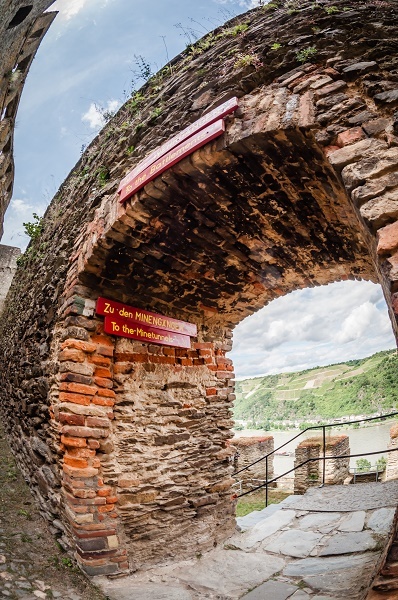 The Rheinfels Castle ruins is a magical place to visit and explore with your family. 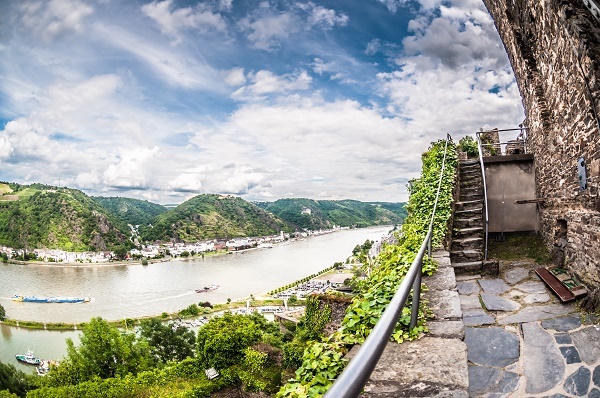 You are literally stepping into history with a real understanding of what it felt like living in this mighty castle while still enjoying the pure beauty of the Germany’s Middle Rhein valley. Admission cost for adults is 5 Euro and 2, 50 Euro for children 6-14. 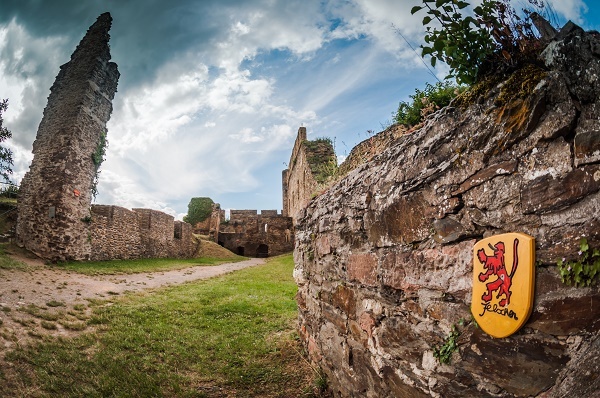 The castle is just under an hour drive west of Wiesbaden, 1 hour and 20 minutes north of Kaiserslautern and 2 hours and 45 minutes northwest of Stuttgart. 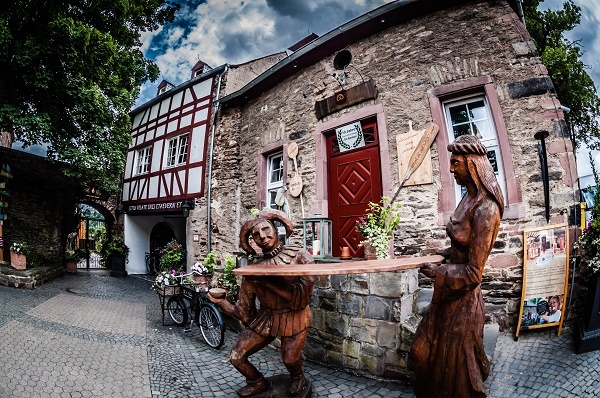 Germany, and she is enjoying her extended European vacation.